TODAY, FORCE, in physics, is defined as an influence that sets a stable body in motion or stops a moving one or changes its direction (1). Also, it has never been recorded so far to be a concept which exists on its own (2), meaning not independent. That is to say, the force itself is owned by someone, by all means, it has an owner (3). At the same time, it is obviously understood that force has been already exerted on a body which is in motion (4), and the passiveness or activeness of the movement is directly proportional (5) with the frequency of the force put into practice (6). Consequently, it is a unit of measurement of the magnitude of the force one possesses (7). It is necessary to make this important point clear that the esthetic, harmony of and balance in the movement, and that it measuredly and regularly takes place indicate the degree of the knowledge and skill of the owner of force. If you apply force to a body at rest, it starts moving (8). However, since it will lose speed from the time it started moving on, it will stop with the elapse of time (9). The fact that it does not stop and saves its same speed as that at the moment at which it started moving is possible only by permanently and controllingly providing the amount of force being continuously lost (10). This means that force has not been carried out once to things with constantly stable velocity and that these things are always followed, not left to themselves. Now after this brief introduction, let's imagine all things in motion in the expanse of our imaginations. The amount of atoms which makes up the point of a fine needle is billions (11,12). Around the nucleus of only one atom, an electron on its orbit of 10-13 cm in radius (13) covers a distance with an imposing speed, which ranges from 3 to 50,000 km a second (14,15). Similarly, let's try to imagine the movements of all electrons of billions of atoms in the needle, then, thinking of that everything is made of atoms (16) ñthe number of atoms in the universe is 1080(17)- the atomic movements of all living and lifeless beings, stars and suns. It is logically deduced that endless movement which everything, from atoms to galaxies, performs is the work of one who is possessed of endless power. This isnot work of nature or such-and-such. For in the movements of these bodies are there such a harmony and a regularity(9) that emerge only from workbench ofendless knowledge. With the up-to-date telescopes, it has been determined that there are about 100 billion galaxies in the universe (18), each of which is made up of 100 billion or so individual stars (19,20). 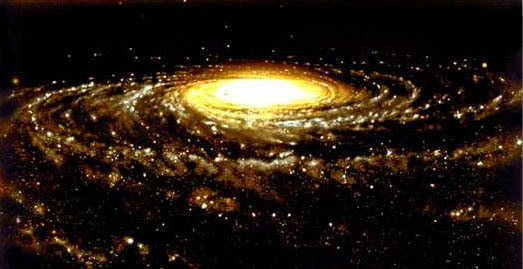 Their hugeness, orbits, speeds are of variety and they have variable movements in different ways in each moment (21). Also, neither are they hung from above with a robe nor they are propped up from below with a pillar (22). Despite these assorted differentiations of these suspended celestial bodies, that they move regularly in the directions traced out for them without giving rise to any disorder is certainly a sign of an infinite knowledge. The first, everything bears witness the existence of that All-powerful with the tongue of its absolute inability which performs the deeds one thousand times much heavier than its capability. The second, everything testifies to that Knowledgeable and Powerful One by moving in conformity with the laws that form the order of the realm and the principles that perpetuate the balance of beings (30). No any conscious in the universe can deny the Creator of the Glory, Who as witnesses as many as the atoms of the universe. If he does, he will become silent because the entire universe will belie him (31). 1. Lafferty, P., Rowe, J. 1994. Force in The Dictionary of Science. Pg 248. Simon & Schuster, New York. 2. Nursi, B.S. 1995. The Twenty-Third Flash-on nature in The Flashes (Translated by Sukran Vahide). pg 243. Sozler Nesriyat, Istanbul. 3. Buchner, L. 1918. Force and Matter. pp. 1-2, 7-8. Peter Eckler Publishing, New York. 4. Athearn, D. 1994. Scientific Nihilism on the Loss and Recovery of Physical Explanation. pg 122. Stata University of New York Press, Albany. 5. Hawking, S. 1990. A Brief History of Time from the Big Bang to Black Holes. pg 16. Bantam Books, New York. 6. Parker, S.P. 1993. McGraw-Hill Encyclopedia of Physics. 2nd (ed). pg 443, New York. 7. Serway, R.A., and Faughn, J.S. 1995. College Physics. 4 th (ed). Pg 84. Saunders College Publishing, New York. 8. Wilson, J.D., Buffa, A.J. 1997. College Physics. Pg 98. Prentice Hall. 9. Hawking, S. 1994. Preface in Black Holes and Baby Universes and Other Assays. pp 117 and viii. Bantam Books, New York. 10. Lerner, S.L. 1996. Physics for Scientists and Engineers. Jones and Barlett Publishers, Boston. 11. Simsek, U. 1979. Atom. Yeni Asya Yayinlari, Istanbul. 12. Eddington, A.S. 1928. Stars and Atoms. pg 17. Yale University Press, New Haven. 13. Halliday, D. et al. 1997. Fundamentals of Physics (5th ed.). pg 25. John Wiley & Sons, Inc. New York. 14. Yegin, M. 1980. Atomdan Hucreye. 3. Baski. Yeni Asya Yayinlari, Istanbul. 15. Ashford, T.A. 1967. The Physical Sciences From Atoms to Stars. 2nd (ed). pg 371. Holt, Rinehart and Wintson, Inc., New York. 16. Asimov, I. 1992. Atom-Journey Across The Subatomic Cosmos. pg 223. Truman Talley Books, Plume, New York. 17. Strauss, S. 1995. The Sizesaurus. pg 175. Kodansha International, New York. 18. Smolin, L. 1997. The Life of the Cosmos. pg 118. Oxford University Press, New York. 19. Asimov, I. 1971. The Galaxy in Universe. pg 48. Walker and Company, New York. 20. Chaisson, E., McMillian, S. 1997. Astronomy Today. 2 th (ed). pg 523. Prentice Hall, New Jersey. 21. Nursi, B.S. 1993. Ayet-ul Kubra in Sualar. pg 106. Envar Nesriyat, Istanbul. 22. Nursi, B.S. 1995. The Thirtieth Flash-The Divine Name of Self-Subsistent in The Flashes (Translated by Sukran Vahide). pg 445. Sozler Nesriyat, Istanbul. 24. Lemonick, M.D. 1993. The Light at the Edge of the Universe pp. 9,23. Princeton University Press, New Jersey. 26. Dickinson, T. 1995. The Universe... and Beyond. 5th (ed) p.89,94. Camden House Publishing, New York. 27. Demirkan, H. 1978. Yildizlarin Esrari. Yeni Asya Yayinlari, Istanbul. 28. Seeds, M.A. 1995. Colliding Galaxies in Horizons, Exploring the Universe. pp 295-296. Wadsworth Publishing Company, Belmont. 29. Nursi, B.S. 1993. Zuhre-Sekizinci Nota in Mesnevi-i Nuriye. pg 164. Envar Nesriyat, Istanbul. 30. Nursi, B.S. 1995. The Seventieth Flash- Eigth Note in The Flashes (Translated by Sukran Vahide). pg 173. Sozler Nesriyat, Istanbul. 31. Nursi, B.S. 1992. Emirdag Lahikasi. pg 203. Envar Nesriyat, Istanbul.